For all Smart Sim users out there. Check out these call and text promos from Smart. Use the keywords below. Enjoy! Subscriber should have the minimum airtime balance of P20 to register to the promo. Subscribers registered to the package can enjoy unlimited calls ONLY to the first 6 SMART/TNT numbers they call up. Upon successfully calling a SMART/ TNT number, subscriber will get a notification spiel informing him/ her that he/ she may enjoy unlimited calls to the dialed number. To check all 6 numbers with whom the subscriber can enjoy unlimited calls, he/ she should send MYGRP to 6630. Subscriber registered to SMARTALK 20 will be charged with the prevailing call rate for any call transaction made to other networks. Amount is deducted from the remaining balance. Subscriber registered to SMARTALK 20 will be charged with the prevailing text rate for any SMS transaction. Amount is deducted from the remaining balance. Concurrent registration to SMARTALK 20 and other unlimited call package is not allowed. The package may not be used for roaming or international transactions. Package must be used for peer to peer transactions only and not for commercial purposes or for spamming. Package offers 100 Smart/Talk ‘N Text sms + 10 sms to all networks + 30 Smart/Talk ‘N Text consumable minutes valid for 1 day for only P25. The subscriber must maintain P1.00 airtime balance to continue using the package. Multiple availment of the Max Call Combo is allowed. Concurrent availment with other packages is allowed. The Max Call Combo shall also be available via Smart Load Retailers nationwide. Package offers 150 Smart/Talk ‘N Text sms + 10 sms to all networks + 10 Smart/Talk ‘N Text consumable minutes valid for 1 day for only P20. To call, the subscriber must dial *2827+ 11-digit Smart/Talk ‘N Text number. Ex: *282709181234567. Maximum call duration is 5 minutes and shall automatically be cut on the 5th minute. Calls may be availed any time of the day. Calls dialed without the calling prefix shall be charged regular calling rates, deducted from the subscriber’s airtime balance. Multiple availment of the AllTxt 20 Combo is allowed. Concurrent availment with other packages is allowed. To register via SMS, subscriber must send C20 to 2827. 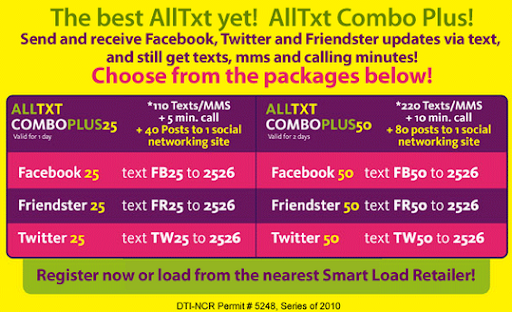 AllTxt 20 Combo shall also be available via Smart Load Retailers nationwide. P1.00 airtime balance must be maintained. Cannot register concurrently with other unlimited call offers. Promo is open to all Buddy Subscribers nationwide. Subscriber must have the minimum balance required (P100 for SMARTalk 100 and P500 for SMARTalk 500) in order to register. Unlimited calling only applies to local calls made within the Smart network. Unlimited calls can be made anytime of the day. SMARTalk’s unlimited calls do not apply to roaming, international transactions and to calls made to other networks. from 10pm to 5pm the next day. Promo is open to Smart Buddy subscribers nationwide. Unlimited calls and texts can only be used from 10PM to 5PM. Calls and texts made between 5:01PM to 9:59PM while enrolled in SMARTalk will be charged with the following rates: 2.50/minute and P0.20/text. Subscriber must have the minimum balance (P100) in order to register to SMARTalk Plus. Unlimited calls and texts only apply to local Smart-Smart/Smart-TNT transactions. P2.50/minute and P0.20/text rates only apply to local Smart-Smart/Smart-TNT transactions. Any roaming, international and transactions made to other networks will be charged with regular rates. Subscriber must have the minimum balance of P15 to be able register to the promo. # Unlimited calling only applies to local calls made within the Smart network. Unlimited calls can be made from 1am to 11am only. Promo runs until December 22, 2010. Per DTI-NCR Permit No. 6451, Series of 2010. To register, just send TALK15 to 6420. *Registration is from 1am to 10am only. Calls are cut every 5 min. You only need P20 for calls up to 20 mins. How?